So you’re interested in building a log home and you’ve heard about log home kits or log home packages. What are these about? Regular houses don’t use these, do they? In fact some do. But log homes are different. And putting together a log home package containing all the bits needed for assembling your cabin makes sense so that you know everything will work together. It’s important to understand what is included in a log home kit or materials package and what is not. Even by knowing what is included it can be difficult to make comparisons between different log cabin companies because each log home manufacturer has a different system for constructing their log homes. These systems involve sealants, log fasteners, log joinery, preservatives, amount of pre-cutting, corner and log styles, wood species, and method for dealing with log settlement. Remember that there is no such thing as the perfect wood; generally the best thing to do is use whatever is the local wood and log home manufacturers in that area will have experience and knowledge in dealing with that species. Likewise, there is no one perfect style of joinery, corner style or cabin design. The most important thing is to find what you like and trust the log home company to deal with the technical issues involving the wood. If you really want to follow the technical path, the ultimate wood resource to delve into is the Wood Handbook. Don’t be misled into seeing a list of logs and thinking that contains everything you need to build your log cabin. Log homes, like conventional homes, still need hundreds if not thousands of individual items that can or should be supplied by your builder or contractor if it is not included in the log home kit or package you select. Designing or selecting an eco log home kit or inexpensive log cabin kit shouldn’t mean that you are scrimping on anything. Clever log cabin home design can save money with energy-efficient log home ideas, space-saving smart storage and satisfying cabin interior design so you can enjoy your own log home without spending too much money. By breaking this down we hope to educate you to make the best choice for yourself. Log Package or Wall Package: This log package would be simply the logs themselves, adequate for building the walls, and possibly some roof beams if specified. Also supplied would be the fasteners and sealants that the log manufacturer has determined to be the best for their logs and the area. This would be a good way to go if you or your builder has extensive experience in log home building and you simply need the logs to build the structure. It is also the cheapest option of the four. You could save even more money by dealing directly with a mill that produces the logs and then sourcing the fasteners on your own. Structural Package or Shell Package: A shell package includes the logs for the walls themselves, along with the more complicated roofing system. This involves more engineering and is a better idea for somebody who wants to build their own cabin but doesn’t have the confidence or resources to engineer the design or doesn’t want to hire an architect. The roof system may by trusses or it may be rafters; with open cathedral-type ceilings it may involve a structural ridge beam or log ridge and these components would be included with this package. Weather tight Package or Dry-In Shell: as the name implies, this package includes the above components, along with everything needed to make the structure weather tight or dried-in. That means in addition to the outside structural logs and roofing you would also get windows and doors and roof sheathing and/or roofing materials.With many new cabins going with the energy-efficient SIPs or structural insulated panels for their quick installation and ability to span large areas, this package could involve an on-site crane for setting these in position. There is something very satisfying about reaching the dry-in stage, where it feels like you can take a breath and relax a bit, knowing your new home is protected from the weather and work can continue regardless of the outside temperature or precipitation. Complete package: A complete log home package may or may not be truly complete. Yes, it will include everything in the weather tight package along with interior items such as stairs, trim, interior doors and interior wall materials, but some companies do not include cabin flooring, kitchen cabinets or utilities such as wiring, plumbing and HVAC systems.This can make sense as these items as very specific to your individual cabin and can usually be sourced and bought cheaper locally. Each trade will supply the hardware components required for their installation and then you can choose the final, visible elements such as cabinets, fireplace finish, fireplace mantels, and hardwood flooring. If you’re looking for a way to live in a log home but can’t afford one of the huge lodge-type cabins you see in the magazines – don’t despair. Log home manufacturers have many small log cabin kits available and nearly all of their log cabin kit plans can be modified to accommodate different sizes. You may also feel that the smart way to live is by reducing the impact we have on our planet and are willing to reduce the overall size and cost of your log home by utilizing space in a smart way and making rooms do double duty. Using small cabin plans you can make every square foot count. You will also be pleased to see the effect going smaller has on your log home kit price. 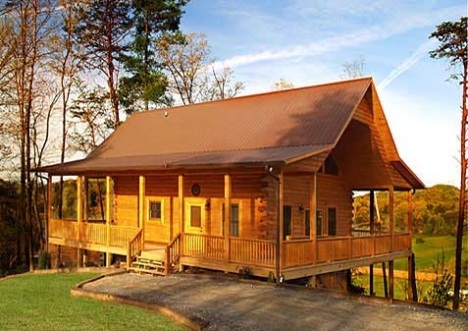 Modular or prefab log homes are essentially the same thing as log cabin kits. The logs and other building components are cut and prepared at the log home manufacturer’s facility, and the cabin is built, then dis-assembled and all the parts are numbered for re-assembly. The log cabin company ships you the log home package to be put together on your building site after you have prepared for your log home package, set up your foundation and installed utilities. Some modular log homes actually come somewhat pre-assembled and a crane lifts each section into place where they are fastened together. It’s common to see large expanses of cabin roofing being set into place with a crane when the builder is using SIPs. These structural insulated panels are built-up sections of roofing composed of layers of OSB or plywood sandwiching rigid insulation. Each or both sides of the SIP can also have a finished covering instead of or in addition to the sheathing. A log home kit or cabin package is a convenient way to buy the logs and building components you will need to build your log home, but it’s important to understand exactly what is included and what is not so you can compare packages from different manufacturers and also to plan and budget for the other items not included in your package.